You can edit an appointment as needed. To open the Overview page of the patient's record, from the Appointment Information panel, click (or tap) the patient's name. However, be aware that any changes to the appointment information will be lost. 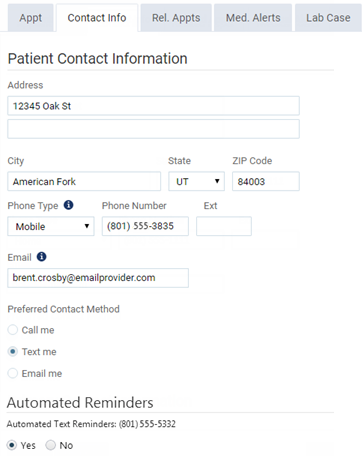 To view, add, or edit the patient's contact information, preferred contact method, and primary contact, from the Appointment Information panel, click (or tap) the Contact Info tab. To view the appointment information for other members of the patient's household who have appointments scheduled on the same day as this appointment, from the Appointment Information panel, click (or tap) the Related Appts tab. To view, add, edit, or delete the patient's medical alerts, from the Appointment Information panel, click (or tap) the Medical Alerts tab. If the patient has an medical alerts, a medical alert icon appears on the appointment. 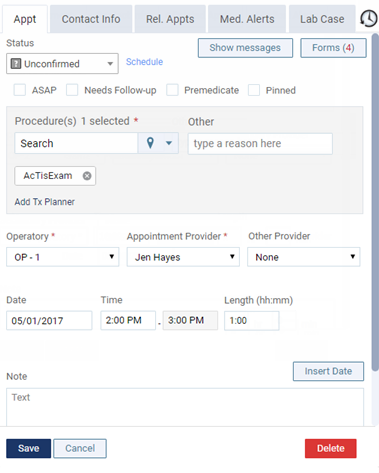 To open the patient's clinical chart, ledger, or treatment plans, click (or tap) Chart, Ledger, or Tx Planner below the patient's name on the Appointment Information panel. Change any of the appointment information, such as the procedure, provider, operatory, date, or time, as needed. Status - Select a different status if necessary. The corresponding status icon appears on the appointment (for example, Unconfirmed is a question mark ). Operatory - Select a different operatory from the list. Alternatively, to quickly change the operatory, click (or tap) and hold and then drag the appointment to a different operatory (on the same date, at the same time, and with the same provider, or not). Appointment Provider - Select a different appointment provider from the list. 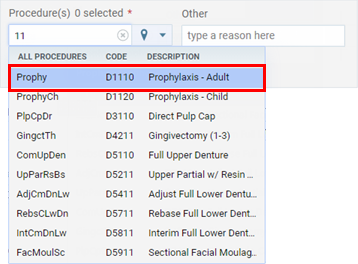 Alternatively, if you are viewing the schedule by provider, to quickly change the provider, click (or tap) and hold and then drag the appointment to the column of a different provider (on the same date, at the same time, and in the same operatory, or not). Date - Click (or tap) in the field to select a different date. Alternatively, if you are viewing the schedule by week, to quickly change the date, click (or tap) and hold and then drag the appointment to a different date (at the same time, with the same provider, and in the same operatory, or not). Time - Click (or tap) in the field, and then change the time. Alternatively, to quickly change the time, click (or tap) and hold and then drag the appointment to a different time (on the same date, with the same provider, and in the same operatory, or not). Tip: You can quickly change the appointment date, time, operatory, and/or provider by clicking (or tapping) an open time slot on the schedule in the column of any provider or operatory (depending on whether you are viewing the schedule by provider or operatory) on any day of the displayed week (if you are viewing the schedule by week) or on the displayed date (if you are viewing the schedule by day).